Oona, Fitz and Finn McAlpine are a family down on its luck. One day they visit Leith Docks and discover a Whaling ship – The Big Betty – rigged and ready to sail. 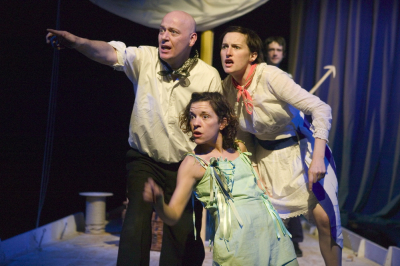 Nin the Boatswain appears and invites them to join the crew in search of a fabled Green Whale – the greatest whale the world has ever seen! Nin tempts them with promises of untold wealth and adventure and the children decide to try their luck! Green Whale is a 4-hander and requires a performance space of 7m/7m with some flexibility. It has previously been performed in theatres around Scotland.